It's an amazing camera that is also a phone! Yep. This is me in high school. I had THE coolest mom. 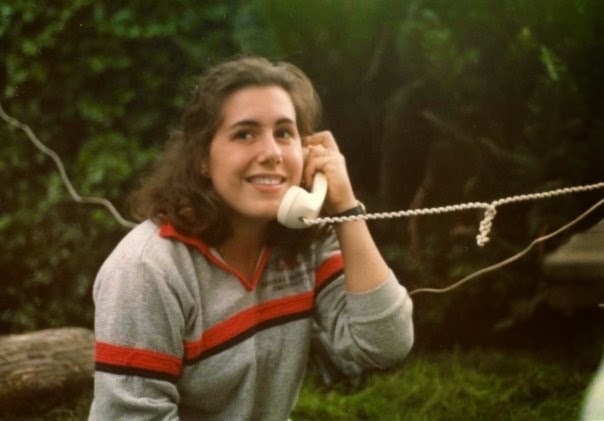 She went to RadioShack and bought a 20 foot cord so that I could drag our telephone out to the backyard and spend endless hours talking to my friends where ever I wanted. Flash forward 15 years and I am impatiently waiting in the car in a very busy pickup zone for my hubby while our 2 very young boys sit strapped in their car seats in the back. As the minutes ticked by I became a more and more anxious. Finally, from the back seat, I hear the small voice of my three year old "Mom give him a call on your cell phone". THAT's Right! I had a cell phone. This was such a new thing to me that it did not occur to me right away that I could just pull a device out of my purse and call someone right from the car. Wow. My kids will never know a time before cell phones. Now flash forward another 10 years and that same 3 year old, now a teenager, was set to get his own cell phone. We went to the store to pick out a phone and we looked around for pretty long time but my son did not see what he really wanted. The salesman finally asked him what he was looking for and my kiddo said "What I really would like is a Camera that is also a phone". There were a couple of other adults standing around who sort of giggled at this. A Camera... That is also a phone? That was just ridiculous. What a silly child. But he knew exactly what he wanted. Since that day when we bought him his first cell phone (which did have a 2 megapixel camera in it) he has gone through several cell phones and the camera features have improved. But now there is a phone that has caught up with this kid's dream. It has 20 megapixels which is better than even most digital cameras (that are only cameras). The Nokia Lumia Icon also lets you #ExploreMore by allowing you to capture sound and video with a full 1080p HD image quality and 4 high performance microphones. This is awesome for people who want to capture video and get it loaded up to YouTube right away. Join us for a Twitter party on Monday to share the excitement about this new phone / camera / media production device. June 30, 2014, at 6PT/9ET join the #ExploreMore conversation on Twitter with TravelingMom (#TMOM) for your chance to win one of two Nokia Lumia Icon phones. RSVP for the #TMOM Twitter party on 6/30 for your chance to win! Follow the hashtags #tmom #ExploreMore #LumiaIcon to be in on the action! You can also jump on the #ExploreMore fun on Instagram all week. Follow these Twitter Panelists for the party!